For some reason, some people don’t appreciate the beauty of a giant beetle flying into things and dying tragically in your swimming pool filter. The ASDM webpage on which I found the reference photo of the larval beetle offers this statement of caution for desert motorcycle enthusiasts who don’t wear helmets: “Being hit in the face by a beetle this size can be quite painful.” That’s probably an understatement; one flew into my head earlier this month and I wasn’t even coming toward it at 60 miles an hour and it still felt like being hit by a rock. Anyway, I think these creatures are fascinating, and, for whatever reason, they don’t feel like cockroaches to me. My response to cockroaches is visceral and immediate; if one crosses my path, I feel compelled to smash it as if it’s a vicious, carnivorous alien (even though cockroaches are harmless, vegetarian, and have been around longer than humans). My response to giant palo verde beetles is, “Cool! It’s a giant bug!” And then I take a picture and send it to my nephew or something. He’s at a prime age to appreciate giant bugs. My first script had the final panel as some snarky remark about how maybe these insects had it all figured out and maybe we’d be better off if we spent our childhood and adolescence underground and then had thirty days to mate before dying, leaving the next generation to figure things out on its own. Then I thought I’d go for a straight biology story, with only a little snark. Then I finished the artwork and thought the panels looked kind of blank, so I put the snark back in, in word balloon form. That’s why the text doesn’t quite fit the space. This entry was posted in comic and tagged amazing, arizona, bugs, comic, creatures, insect, insects, monsoon, monster, monsters, nature, pencil, sonoran desert on July 16, 2018 by littledragonblue. What is this, a doorway for ants? Yes, that is exactly what it is: a doorway for ants. There were a couple interesting shots on my last roll, including a couple decent but not mind blowing bee pictures, some vast sweeping vistas, majestic trees, weirdly blue skies beside ominous silver clouds, lines of distant storms on the horizon, things of that nature. But this seems to be the most striking image. It’s a yucca flower, into which the ants have cut their own ant-size door for nefarious ant purposes. Took a couple good shots of ants on other blossoms slipping in and out between the edges of the petals, but this bud must have been especially tasty, because the ants just couldn’t bother with all that mucking about between layers. They just went straight for the core, like a mad scientist with a mole machine. Ants are pretty interesting. I messed around with the contrast and such in Photoshop just to really bring out as many details as possible. I’ve taken a lot of pictures of yucca flowers, which grow in great, beautiful clusters, but they don’t seem to really stand out in pictures. I guess that’s true of most white flowers. Maybe if you put them against a black background. Also found a couple recently deceased figeater beetles. These are large bugs with splendid iridescent green shells. I wanted to say “carapaces,” but Google told me that carapaces aren’t associated with beetles, and only refer to the top part of the shell, whereas the figeaters are more resplendent on their undersides, for some reason. Will try to figure out how best to capture their visual essence. Had two positive, encouraging, useful interactions with great writers today. That’s always nice. They both have suggestions for things I must do to be more successful, on top of the list of things the Rabbit has already told me I have to do to be more successful. The Fox cancelled our Tuesday writing meetup due to an in-law situation which required his emotional support, but Misses Kitty came over instead and persuaded me to make her brownies. I tried to invent a new sugar-free, gluten-free brownie recipe and instead invented a new sugar-free, gluten free chocolate cake recipe. It’s pretty good. You’d never guess it was sugar-free or gluten free. It’s not even midnight. I promised to create a logo for someone, which will benefit me in the long run, so even if it’s not necessary an integral part of the list of thing I must do to be more successful, it’s still a thing I should day. And I guess every time you succeed at something, you are more successful. ETA: Redditor blacksheep998 seems to think that this door is too big for ants and that it is actually a bumblebee door. This entry was posted in photgraphy and tagged cool, flower, insects, macrophotography, photography, photoshop on July 20, 2016 by littledragonblue. You might think these were dragonflies, but you’d be anatomically incorrect. Dragonflies have dissimilar front and back wings, and keep their eyes close together. Damselflies have wings of the same size and keep the eyes on opposite sides of their head. 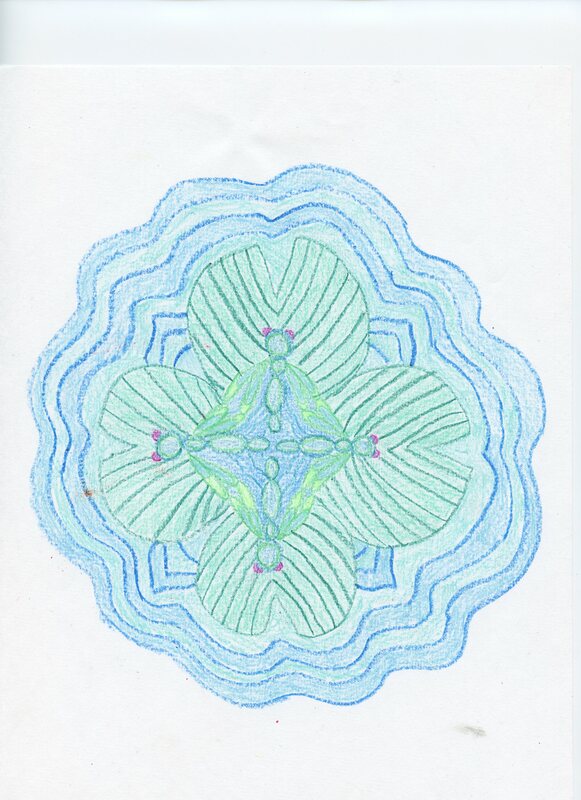 Those are lily pads, though, with rippled water forming the outside edge of the mandala. It’s a cool shape, too. I’d like to do something that maintains the angles and proportions of this form as it expands, with the points and curves alternating and expanding. Today was rather unproductive for me in general. After biking 3 miles to try West African food (goat soup and fufu cooked by a dude from Benin) for lunch, I took a salsa dance class and then ate chicken and waffles with The Man the Misseses Cat. Now it is very late and this blog still hasn’t been updated and nothing related to visual art will be accomplished today. I wasn’t a complete waste of brain, at least. In between lunch and the salsa class I spent a lot of time working on my 4th essay for Panel.net, so I did write for a couple hours, but not with the focus that used to consume my writing. Still, I’m pretty excited about this one. My 3rd piece, “I’m Gay, Who’s My Dad?” came out today but did’t seem to get as much traction as the previous 2 pieces. I thought it was a pretty catchy title, but nothing. No comments, no likes, no tweets. But this next one should get a little more attention, I think. Anyway, it doesn’t matter, because I write for myself, of course. The only person who needs to approve of or get excited about my work is me. But, you know, I do have meaningful things to say, to anyone who wants to listen. This entry was posted in Uncategorized and tagged cats, comics, food, insects, mandala, writing on March 19, 2015 by littledragonblue.